Enjoy an outdoor dinner while sitting comfortably at the Dura-Trel Picnic Table. This sturdy 6' table will make it easy for you to sit back, relax, and enjoy life in your yard without ever worrying about maintenance. 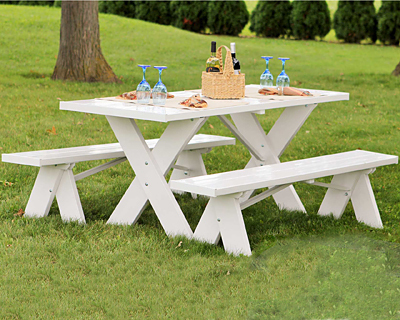 This elegant yet durable picnic table features wood reinforcements in its rails to add strength and prevent sagging. Without worry of slivers or snags, the smooth vinyl surface of the unattached benches will provide a comfortable place to sit on the warmest of days. Dura-Trel picnic tables are constructed of the highest quality vinyl, which contains the greatest concentration of Titanium Dioxide available. Titanium Dioxide is a powerful UV stabilizer that protects the vinyl from the harmful ultraviolet rays of the sun. This table will never fade, crack, peel, or rot and there is no need to paint it. Consider this bench as an ideal accent for weddings. Assembly required. Made in the USA. Twenty year guarantee. Note: This Dura-Trel Picnic Table features table legs, seats, and three table rails reinforced with wood inserts.